I’ve told you practically all you need to know about the cake at Bea’s when I went to the Bloomsbury branch. All you really need to know is that the cake at Bea’s of St Paul’s is every bit as good. 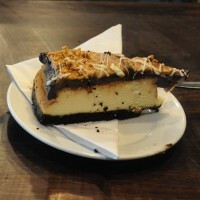 I had the chocolate and peanut butter cheesecake this time and was glad that I had a comfortable seat in the corner, with room to lie down if needs be. That was one rich, rich cheesecake. If it had been any richer, it could have paid off the national debt all by itself. It’s worth mentioning the coffee: my espresso was lovingly made and was served in a glass, which was a nice touch (not enough places serve espresso in a glass in my opinion). As was the case with Bea’s of Bloomsbury, it wasn’t quite to my taste, but that’s neither here nor there. Downstairs there are three small tables, all seating two people, in a narrow strip by the window, but the main seating is upstairs on the mezzanine level. Here there are two large seating areas which each takes 12 on six individual tables, while right at the end is a booth seating four (or six if you squeeze). Unsurprisingly, I ended up in the booth. Sitting up on the mezzanine level, I practically had the place to myself, which, I’ve been told is quite rare. Before I left, I had a long chat with the manager Zuza and her lovely staff, who were very attentive and yet at the same time quite happy to leave me to my own devices upstairs. They told me that I’d managed to come on their quietest day of the year, which explained a lot. Although I liked the cosy, intimate feel of Bea’s of Bloomsbury, in its own way, Bea’s of St Paul’s has a lovely atmosphere, more relaxed and conducive to lingering (although I never felt pressured to move on at Bea’s of Bloomsbury either). Although there’s no wifi, you should be able to connect to One New Change’s free wifi provided by the Cloud (I managed it). In closing, I have to say that the staff at Bea’s of St Paul’s were even nicer than those at Bea’s of Bloomsbury. This, by the way, is not true: I was made to say this. In truth, both sets of staff are equally lovely. However, at the time, I was outnumbered four to one and at least one of them was between me and the door. It was clear to me that I wasn’t going to be allowed to leave until I’d promised to say the staff were nicer. So, there, I’ve said it. Can I go now please? This entry was posted in Breakfast, Cafes, Cake, Cake Shops, Central London (East), Evening Opening, Late Opening, Lunch, Sandwiches and tagged include, Square Mile by Brian Williams. Bookmark the permalink. Top tip! If you go on a sunny afternoon aim for upstairs tables, the downstairs can get a bit warm.